Participating journalists will carry out training and mentoring sessions for entry-level journalists across ten cities in Pakistan to encourage fellow journalists to conduct fair, impartial, balanced and ethical reporting, while maintaining a safe and controlled working environment. The participants of today’s train-the-trainers session are active alumni of the UK’s flagship Chevening and South Asia Journalism programme which is funded by the UK Foreign and Commonwealth Office. Through this programme, Pakistani journalists studied for three months at the University of Westminster with colleagues from around South Asia. 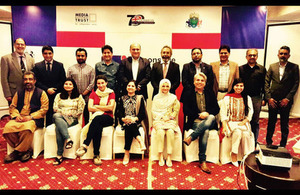 They are now using their experience and skills to teach and support the next generation of Pakistani journalists. During my first few weeks in Pakistan, I have experienced its thriving media landscape. News consumption is higher here than in most countries with a remarkable number of organisations producing news content. This puts greater responsibility on journalists to report their stories accurately, ethically and in a way which does not compromise their safety and security. Giving back to the community is an important part of the Chevening Scholarship programme. I am impressed by the energy of our Chevening alumni today who have committed their time to impart their wisdom and skills to their peers. Today’s training session and the follow-up sessions in the coming weeks are part of a series of training programmes for Pakistani journalist that we are funding and supporting to promote higher standards of journalism in Pakistan. These workshops have been aimed to create a pool of journalists who collectively promote media ethics and responsible journalism amongst their peers. The UK’s Chevening South Asia Journalism Programme Fellows undertake a bespoke programme titled ‘Good Governance in a Changing World: the Media, Politics, and Society’. It explores the different ways in which the media play a part in holding democratic processes to account, including government, the civil service and security, as well as the broader political system in both the South Asia region and the UK.